Creating your own booklets? 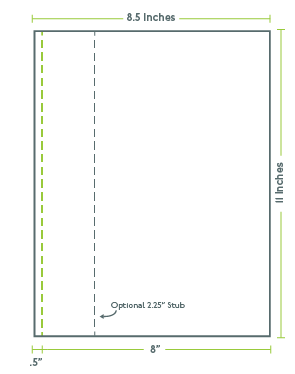 Use this standard perforated layout to print the pages on your printer or copy machine! Perfed in 1 column by 1 row with a 1/2" left margin, these letter-sized (8.5" x 11") sheets will help you bring your project to life. 1 piece is the size of a full sheet of paper—perfect for tear-out booklet pages. Perfed with a 1/2" left margin. Many paper colors and stocks from which to choose. Suitable for use in most copy machines, as well as inkjet and laser printers. Design and print tickets, brochures, postcards, invoices, and more with help from PerforatedPaper.com!